Like a lot of people I spent most of last Friday, 29th April, glued to my TV watching the Royal Wedding. As interested as I was in seeing the bride's dress, as a fashion fan I was also really interested to see what the guests would be wearing and seeing as I have a particular interest in asian fashion I was keen to see if there would be any on display! 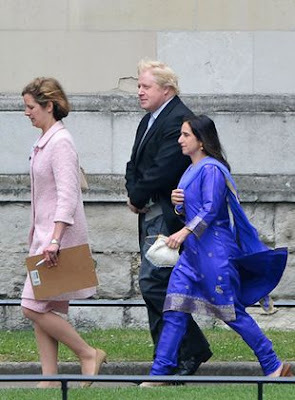 First up there was Marina Johnson, wife of London Mayor Boris Johnson, who wore a dark blue churidar suit and in my opinion looked as if she didn't make much of an effort! I get that at non-asian weddings, some of your more heavily embroidered asian outfits would look over-the-top and out of place, however I think her of outfit choice was just too plain for such a grand occassion. 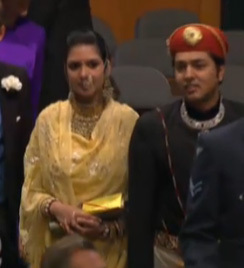 Then there's the lack of accessorising and styling, most of the other female guests had perfectly-styled hair with matching hats - of course a hat wouldn't quite look right with this outfit, but she could have worn *some* kind of hair accessory or styled her hair in some way? and I know the picture doesn't show her feet but it looks to me like she's wearing flats - a pair of heels could have made this outfit 100 times better! I do think the jewellery is a little over the top - heavy necklace, earrings and of course that impossible-not-to-notice nath nose ring, but you've got to give this woman props for going all out and really working her chosen look. In my opinion she looks much better than Marina Johnson. If were invited to the royal wedding and had to wear an asian outfit, what would you wear? Great post! I agree completely about marina johnson's outfit. I would have gone for a chudidaar in a contrasting colour to liven up the outfit a bit, and styled my hair. Also, a better clutch and shoes!!!! Her and the PM's wife both got slated for not making an effort. Maybe there's something about being the wife of a politician? 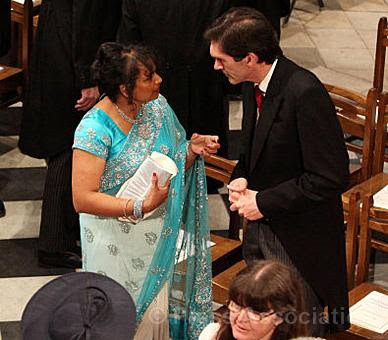 That lady with the nath looks like the wife of a member of some royal family, I think a nath can look strange, but for foreign dignitaries, the more ethnic, the better it looks to the press. And besides, she made an effort, so good on her.